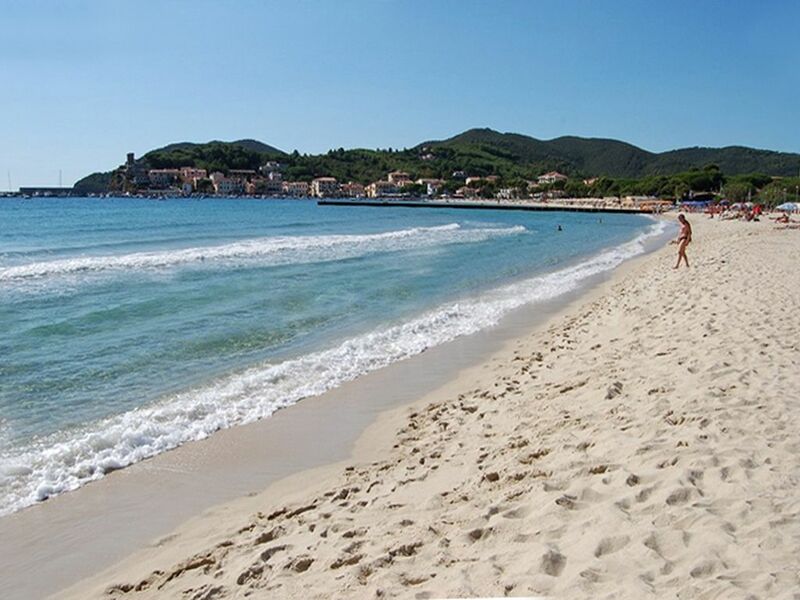 Holiday apartment CRIS is a beach rental located in Marina di Campo. This simple but clean air-conditioning rental, for 2-7 persons at the first floor of Villa Cristina is just perfect for your vacation getaway! Located just 100 meters from the sandy beach at Marina di Campo - great for kids! This is the perfect place to enjoy harbor and beach lifestyle. The apartment has air-conditioning, a masterbedroom with doublebed and one singlebed, another bedroom with 2 singlebeds, kitchen, living room with sofabed and a bathroom with shower, wc, bidet and washing maschine. What is really most unique to CRIS are the nearby restaurants, bars, shops and bakery... all within minutes by feet! The island of Elba offers a lot to discover: nice beaches, mountains to climb, nice villages and harbours, local manifestations and culture events. The island of Elba is a world apart - an Mini-Italy. It offers all the best what Italy has to offer: beautiful beaches with turquoise clear water, mountains, festivals, art cities and culture events. Great bike rides for everyone: technically-challenging mountain bike tours and bike tours also for families with children. Our apartments in "Villa Cristina" are a good starting point for all activities - not only for beach and sea. All apartments have a separate entrance, air conditioning, washing machine. The decor is simple but good. "Villa Cristina" is located in a quiet residential area and you can easily do all your shopping by feet or by bike. The beach of Marina di Campo is ideal for families with children: large sand beach - for 50 meters the water will never exceed hip level. You can walk comfortably with the stroller to the beach. There is also a children's playground rihgt near the beach. Die Ferienwohnung ist wirklich nur einen Katzensprung vom Strand entfernt. Zum Stadtzentrum sind es nur wenige hundert Meter, trotzdem ist es schön ruhig in der Wohnung. Nur die Parksituation für das Auto ist manchmal Glückssache. Die Wohnung ist ausreichend ausgestattet, wenn auch nicht alles neu ist - genug Geschirr ist vorhanden und alle 3 Räume sind klimatisiert. Und die Betreuung vor Ort war super, wenn auch nicht Deutsch, sondern Englisch. Alles in allem eine schöne Ferienwohnung, die man gern weiter empfehlen kann, und die wir sicher auch selbst noch einmal nutzen werden. Schöne, große Wohnung, sehr nette Einführung. Prezzo incl. pulizia finale - Price incl. final cleaning - Preis inkl. Endreinigung.